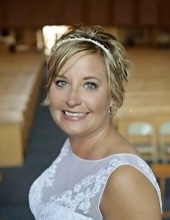 Nicole Gari Ressler (Forsman) passed away unexpectedly on March 7, 2019. Anyone who knew this little spitfire knows this is very sad news. However, she would desire a time for all of us to come together to celebrate her life, laugh, and share fond memories. Nicole was born in Great Falls, Montana on November 6, 1977, to parents Gary and Linda Forsman. She graduated from Fort Benton High School in 1996 and went on to graduate from Dawson Community College in Glendive, Montana in 2000 with an associate’s degree in human services. During her college years, she began working at a daycare and after she finished college, she never left. She lived and worked in Glendive for the next 13 years. She loved her place of employment, being with children, and spending time with her friends. Through great friends in Glendive, Nicole started talking on the phone with a mysterious man named Troy and in 2013 she moved to Anchorage, Alaska, to be with him. Troy and Nicole were married on June 13, 2015 in Bismarck, North Dakota. Nicole loved her friends and making people laugh. She chose you as her friend and not the other way around. Hence, her friends were various, unique, and from all age ranges. She had a fetish with doing laundry, watching Bravo channel, and relaxing on her Temper Pedic. Her spouse was subjected to many hours of unwanted episodes of Housewives of Various Cities. She loved her husband and her family. Nicole is survived by her husband, Troy Ressler, who lovingly refers to Nicole as “Noodles;” mother Linda Arganbright; father Gary Forsman (Doreen); sisters Lisa Forsman, Dana Terry, her family: Jordon (Jenny), Brady, Abigail, and Brianna, and Marci Curtiss (Glenn), her family: Josh and Cassie. She was preceded in death by her grandparents, Arthur and Wilma Forsman and Roy and Jane Myers; and her brother-in-law, Bill Terry. Visitation will be Friday, March 22nd, 2019 from 5:00 p.m. to 7:00 p.m. at O’Connor Memorial Chapel. A funeral service will be on Saturday, March 23rd, 2019, at 2:00 pm at the O’Connor Memorial Chapel, 2425 8th Ave N, Great Falls with burial immediately following the service at Highland Cemetery. The family’s preferred florist is Herman’s Flowers, 406-452-6489. To plant a tree in memory of Nicole Gari Ressler, please visit our Tribute Store. Burial immediately following the service at Highland Cemetery. "Email Address" would like to share the life celebration of Nicole Gari Ressler. Click on the "link" to go to share a favorite memory or leave a condolence message for the family.